"Samists with Fr. 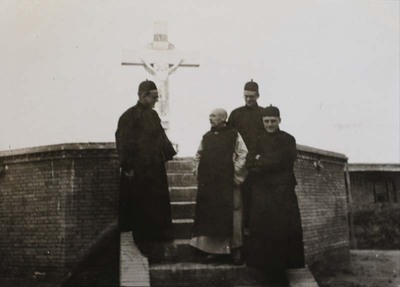 Vincent Lebbe at Monastery of the Beatitudes"
Samists with Fr. Vincent Lebbe in front of crucifix in the courtyard of the Monastery of the Beatitudes. Left to right: Fr. Nicolas Wenders, Fr. Vincent Lebbe, Fr. Raymond de Jaegher, Fr. Paul Gilson. Samists with Fr. Vincent Lebbe at Monastery of the Beatitudes. November 1931. Société des Auxiliaires des Missions (SAM) China Photograph Collection, Whitworth University Library, Spokane.